﻿Syracuse, N.Y. - Action and adventure junkies will soon have one of the most complete and diverse entertainment venues in Central New York to harness their adrenaline. 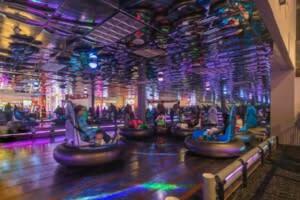 Apex Entertainment Center, boasting over 55,000 square feet of fun for all ages, has announced plans to bring its thrill-inducing mix of amusements and attractions to Destiny USA. The action-packed venue will occupy the former All-Star Alley & Tavern space on the third level of Destiny USA’s Canyon Area and undergo a complete transformation prior to opening. Apex Entertainment Center is scheduled to open later this year. Pyramid Management Group, owner of Destiny USA, is one of the largest, most innovative, privately-held shopping center developers in North America. Headquartered in Syracuse, New York, Pyramid&apos;s portfolio of retail-based, tourist, and entertainment destinations dominate the northeast, with 16 properties located throughout New York, Massachusetts and Virginia. For over 40 years, Pyramid has lead the industry by combining the best elements of traditional retail with world-class dining and entertainment, all under one roof. For more information, visit www.pyramidmg.com.